Show your love as a ZooParent through Instagram or Twitter and be entered to win a grand prize featuring a behind-the-scenes Real Close Tour and a Jaguar ZooParent adoption. Contest runs through August 31, 2013. Take a photo of you and your ZooParent plush animal doing something fun to share with us on Instagram or Twitter. You can be at the zoo, around town or even at a tea party in your backyard. Get creative! 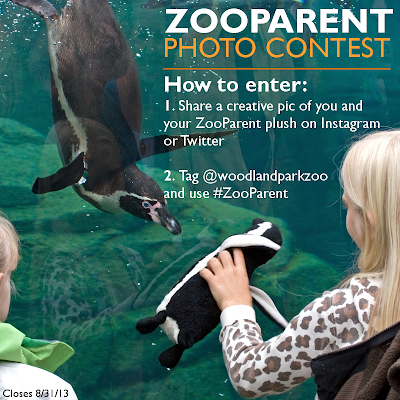 Tag @woodlandparkzoo in your Instagram or Twitter photo entry and include #ZooParent to be automatically entered into the contest. See complete rules and prizes. Good luck!